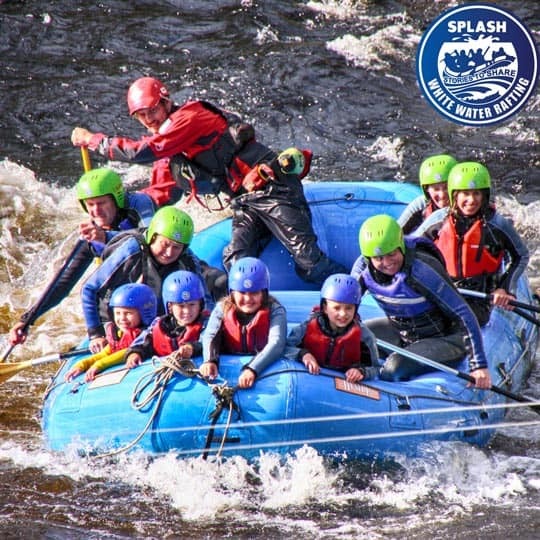 Here at Splash, White Water Rafting is for all the family, you could say it’s family white water rafting, our rafting adventures start from 8 (eight ) years old, which means that for most “Family white water rafting” is possible. Our family friendly river is the River Tay, the section that is rafted stretches from the Town of Aberfeldy to the village of Grandtully which is around 6 miles. The section has plenty of everything from flat water to hone your skills, master working together as a team, play games and get familiar with the beautiful scenery. It also has plenty of rapids throughout to keep your heart rate up and the excitement flowing. We highly recommend our Family White Water Rafting trips, we believe getting young folk out into the outdoors is of major importance as it is excellent for them in every respect, helping them develop as fine young folk. From team building, managing risk, experiencing adventure (not just watching it on facebook), meeting new people and working with them as a team, achievement, commitment, exercise, fresh air and spectacular scenery, all whilst having fun. These are great things for inspiring a young mind for the future. The area of highland Perthshire where we are based has lots of other activities and lots of excellent food and accommodation providers in the area, making for an excellent location to come and spend a day or weekend with the family.